If you follow me on Instagram you will have seen pictures from a beautiful launch event that I attended, held for the release of Emma Hardie's latest addition to her world renowned skincare range. Here I will tell you what's in the tube, next I will tell you if it actually does anything. Moringa Oleifera Seed Oil known to leave skin more vibrant, plum and gives the look of glowing radiance. Red Algae. Reduces the appearance of pigmentation and has a calming effect on the skin. Trademarked Plant Stem Cell product Resisteem™ said to visibly improve the evenness of the complexion. Hyaluronic Acid which we know firms and moisturises. Hyaluronic Filling Spheres to plump the skin and reduce signs of lines and wrinkles. Amino Acid derivative to brighten the skin and even out even the most stressed skin. Edelweiss Extract to promote a soothing effect including collagen protection and antioxidants. On a clean skin apply a good layer of the mask to face and neck, relax for 10-15 minutes and rinse off with warm water. I waited 15 minutes, rinsed, patted dry and studied my face up close and personal! What I saw was a visible difference in the calmness to my skin, I do tend to err on the pink side especially after cleansing, but my skin had a calm even look to it, if felt no less than amazing, soft, hydrated, no irritation and super smooth, it had that feeling you get after a thorough salon facial. There are 3 recommended ways to use this mask, and I tried all of them, the second being as an overnight treatment. I have to be honest and say this was my absolute favourite method, it's such a lovely feeling knowing you are giving your face the best possible hydration overnight, waking up and touching your face while looking in the mirror is something to look forward to, as you are rewarded with the best possible start to your daily make up routine possible. The third method is to place your mask in the fridge for a cooling effect, this I would say is for the Summer or the brave! it really wasn't something I was keen on, although it did warm up in a couple of seconds and act in the exact same way as method number one. 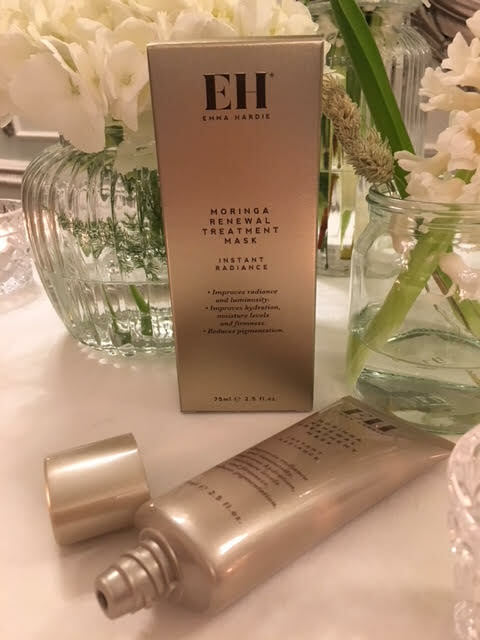 A top tip from Emma to ensure absolute maximum absorption of your mask is the cleanse with your Moringa Balm and adding a pinch of exfoliating rose hip seeds to act as a complete exfoliator. I have to be honest and say this has really peaked my interest, I have yet to try the Rose Hip Seeds in my Moringa Balm, and as I do love exfoliation these are currently on my "Must Try" list, I will report back on this method. To Sum up, I would absolutely spend my own money on this mask, and can imagine it becoming as much loved as my Emma Hardie Moringa Balm. Post contains brand/agency samples unless stated. This sounds really nice , I think I would enjoy as an overnight mask as well!! !